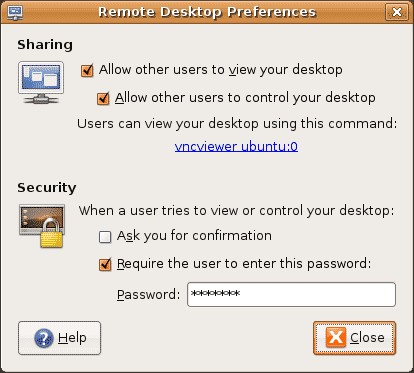 One major advantage of using Remote Desktop sharing is that once the system is up and running, you do not need a monitor, keyboard or mouse connected to the machine. The box running Ubuntu or a Debian based OS can be controlled directly from another machine that already has these hardware components in place. Another great advantage is that you can remotely access and control or administer your system from another location. Possibly outside of your local network, ie: work, school, friends house etc. Next, move to the machine you will be accessing this box from. 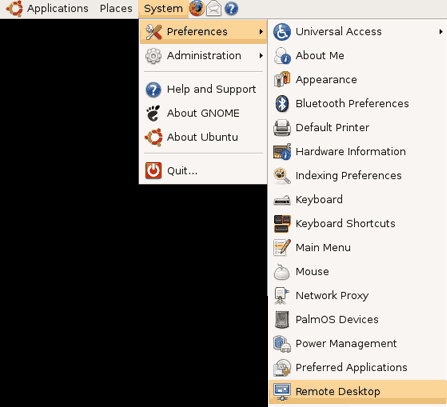 If you will be connecting from a Ubuntu client, you can skip the section A and go straight to section B. Launch RealVNC by navigating to Start ->All programs -> RealVNC -> VNC Viewer 4 -> Run Listening VNC Viewer and then click the icon from your taskbar. If all goes well, you should be remotely connected to your Linux box. Note that you can also connect using the internet broadcasted IP address. To do this, (if your using a router) you need to ensure that port 5900 is open for the local IP of the Linux box.